The authors have found this test to be highly efficient and accurate for diagnosing even early-stage hip pathology. The physical examination of hip joints includes evaluation of the range of motion with some classical procedures, such as Patrick’s test and Thomas test. Positive results of these test are often followed by the diagnostic imaging examinations – for example, the roentgenogram, CT scanning, and MR imaging. Patients with hip pathology, however, do not always complain of hip pain. The pain or discomfort of low back, lower extremity, groin, thigh, buttock, or knee are all common complaints that may be caused by hip pathology. Moreover, the hip joint is deep-seated and difficult to be palpated compared with the spine and the knee. For these reasons, physicians sometimes misdiagnose and treat the wrong part of the body instead of hip joint. To avoid this inaccuracy, we have been employing the pendulum test for all patients with complaints of low back, hip, and knee pain or discomfort. This test has been used as one of the maneuvers to diagnose and manage patients prior to hip surgery . We have found that to be highly efficient and accurate for diagnosing even early-stage hip pathology. Once a patient is suspected of pathology involving the lumbar spine or hip or knee joints, we take a detailed clinical history and then perform the pendulum test at the beginning of the physical examination. The patient is sitting on the edge of the examination table, bilateral hips and knees flexed at 90° degrees and feet are off the ground. Sitting in front of the patient, the examiner holds the knee gently with one hand and grabs the ipsilateral ankle with the other hand. Then, the examiner gently swings the patient’s lower extremity in and out as a pendulum (Figure 1). Figure 1. Pendulum test maneuver. Internal (a) and external rotation (b) of the hip joint at 90° of hip and knee flexion is demonstrated. This in and out motion demonstrates external and internal rotation of the hip joint, respectively. Usually this test is performed on the asymptomatic side as a baseline before examining the contralateral limb. The test is regarded as positive when the patient demonstrates discomfort, pain, or a noticeable difference in the range of motion in the hip joints. Accompanying pain or discomfort on the ipsilateral hip or groin indicates the existence of hip joint pathology. Limited hip rotation, especially internal rotation, is evidence of anatomically advanced pathology of the hip. We undertook a study to document the efficacy of the pendulum test for detecting hip pathology in patients with low back, hip, and knee pain. The study was approved by our Institutional Review Board (IRB), and no funding or financial benefits were provided to the authors for this study. Forty consecutive patients in our outpatient clinic who had complained of pain or discomfort of the low back, lower extremity, hip, groin, thigh, buttock, or knee were examined. Twenty-two patients were negative for the pendulum test and 18 patients were positive. There were 21 patients who presented with a complaint of knee pain or discomfort. Of these, 2 had a positive pendulum test. They were found to have aseptic loosening post-total hip arthroplasty and osteoarthritis (OA) of the hip. All 8 patients with groin pain and 3 patients with hip pain had a positive pendulum test. All were shown to have diagnosed with hip-related diseases. Eight patients had a complaint of low back pain, together with the pain of hip, groin, thigh, buttock, or lower extremity. Three had a negative pendulum test and 5 had a positive test. Especially for these cases, the pendulum test was extremely effective in for differentiating hip from low back pathologies in spite of their complex presentation. Although some cases had both OA of the spine and the hip, it was possible to distinguish which was the more critical complaint in these patients. Consequently, all positive pendulum tests correlated with hip pathology. A 66-year-old male presented with a chief complaint of intermittent discomfort in his knees bilaterally while walking; the discomfort was greater in the right than in the left knee. He had suffered an insidious increase in symptoms over the past year, without any history of prior trauma. Because of the tenderness of the medial side of both knees, he had been diagnosed with internal derangement of the knees. However, the knee joints had full of range of motion without swelling or effusion. Moreover, there were no objective findings consistent with knee on the roentgenograms and MR imaging. Conservative treatment of the knees had not been effective, and thus he was referred to our clinic for a second opinion. Although his knees were examined in great detail, the referring physician had not performed an examination of the hips. On presentation, the patient was independently ambulating without a cane. However, his right lower extremity was slightly externally rotated while walking. The pendulum test was performed, and he complained of discomfort in both hip joints, greater in the right than left, especially when the right was internally rotated. The arc of movement was decreased bilaterally more in the right than in the left hip. Therefore, hip pathology was suspected. The roentgenogram findings of the hip joints showed early OA with slight osteophyte formation and a joint space narrowing (Figure 2), confirming the efficacy of the pendulum test. Figure 2. Roentgenogram findings on the anterior-posterior (a, b) and lateral views (c, d) of the bilateral hip joints. 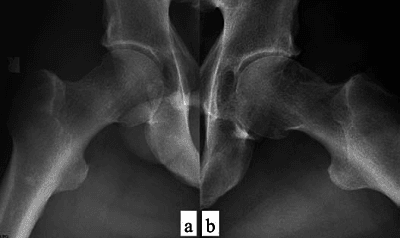 Osteophyte formation and joint space narrowing were slightly detected in the right hip at the lateral view (arrow). 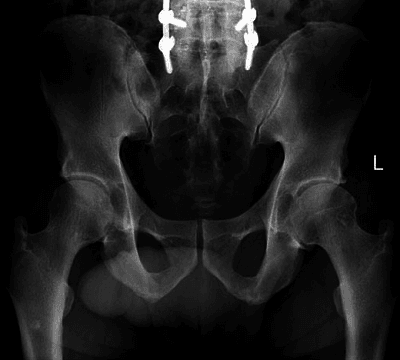 A 55-year-old male patient presented with a chief complaint of left groin pain. He had developed increasing intermittent discomfort in the left groin, aggravated with activities and restricting range of motion, over the course of many years. He was status post-spinal fusion of the fifth lumbar and first sacral vertebrae. The patient’s physician suspected the cause of the groin discomfort was increasing demand on hip range of motion following the spinal fusion. However, the hip joints had not been evaluated. The patient presented to our institution for a second opinion. With the pendulum test, the patient complained of discomfort on internal rotation of the hip, greater in the left than in the right hip. Further, the test showed limitations in internal rotation of both hip joints, with more severe limitation in the left hip. The patient was asymptomatic in the right hip, although internal rotation was also limited on the right. The roentgenogram showed that mild OA on the left hip and minimal OA in the right hip (Figures 3-4), again confirming the diagnostic accuracy of the pendulum test. Figure 3. Roentgenogram findings of the pelvis, post-spinal fusion surgery. Figure 4. Roentgenogram findings on the lateral view (a, b) of the bilateral hip joints. Mild OA on the left hip and minimal OA in the right hip were detected. In outpatient clinics, physicians are often misled by the location of the patients’ complaints of pain or discomfort. Although the pathology emanates from the hip joint, patients sometimes complain of the low back, thigh, or knee joint pain. For this reason, physicians may focus on the site of the complaint and unfortunately have their attention drawn away from the true site of pathology. This leads to misdiagnosis and mistreatment. Conversely, even if a physician suspects hip pathology, and begins with an examination of the hip joint, patients who complain of low back or knee joint pain may feel uncomfortable and distrustful and may lose confidence in the physician, believing their complaints come from the symptomatic sites and not the hip. The lumbar spine and hip and knee joints are anatomically related and work synergistically during activities of daily living. Because the pendulum test is simple, accurate, and effective, we routinely perform it at the beginning of physical examination for patients with low back, hip, and knee complaints. This test is easily performed without the patient’s awareness that the hip joints are being assessed. Thus, we can evaluate hip joints accurately with the patient in a relaxed condition. Once the pendulum test is positive, the meaning of the test is explained as an evaluation of the hip joints and further physical and imaging examinations of the hip joints are continued. The hip is a ball-and-socket joint that provides no geometric resistance to the rotational torque. Thus, rotational movement depends on a static ligamentous structure (especially the iliofemoral ligament) and the dynamic action of the gluteus medius. The iliofemoral ligament, also is known as the Y-shaped ligament, is the largest ligament in the body and tightens with internal rotation [2,3]. When the hip joint is inflamed, synovial liquid increases, the capsular ligaments become swollen, and the intra-articular pressure rises. These reactions cause tightening of the capsule and are manifested as acute groin discomfort. To reduce the symptom, patients will reflexively assume an external rotational posture to relax the capsular ligaments . 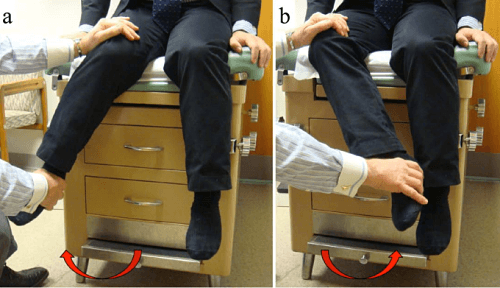 As a consequence of external rotational positioning of the lower extremity, the ipsilateral knee is subjected to increase torsional stress, as seen in the first case. The knee is not designed to tolerate this torsion force because it is a hinge joint. This transfer of rotation force from the damaged hip to the otherwise normal knee causes pain and stress at the medial and the patellofemoral components of the knee. We diagnosed this first case as OA of the hip joint, with pain at the knee due to secondary mechanical stress. In the second case, both the patient and the physician believed the groin pain had caused by the restricted lumbar motion following the spinal fusion surgery. However, the pendulum test was positive, proving the groin pain was due to OA of the hip. Many tests have been described for evaluation of the hip. The Patrick’s test, also known as the Faber test, is often performed to evaluate the hip and the sacroiliac joint. With the patient supine, the tested hip is simultaneously flexed, abducted, externally rotated, and extended by the examiner. While holding the contralateral anterior superior iliac spine, the ipsilateral knee is stressed as it is lowered toward the table. If the knee does not lower to the table, it is suspected that the patient has a hip flexion contracture or protective illiopsoas spasm. Reproducing the ipsilateral hip pain is suggestive of hip joint disorder. Pain elicited on the contralateral side is suggestive of sacroiliac joint disorder. The Thomas test is used to demonstrate a hip flexion contracture. While supine, the patient brings 1 knee to the chest. Flexion in the patient’s contralateral hip indicates tightness of the iliopsoas, tensor fascia latae, or rectus femoris. Femoroacetabular impingement (FAI) is a condition of subtle developmental abnormalities of the hip [4,5]. The flexion-internal rotation-adduction impingement test to detect FAI is performed by the examiner with the patient supine. If the pain is reproduced, it is suggestive of FAI. The accuracy of these tests has been proven [6-9]. These examinations of the hip joint require the patient to lie supine and prone on the examination table. However, it is difficult for patients to assume these postures if they have low back, hip or knee symptoms; have flexion contracture of the hip joints; or are recovering from certain surgical procedures. Therefore, a test for hip pathology with a patient seated is advantageous. 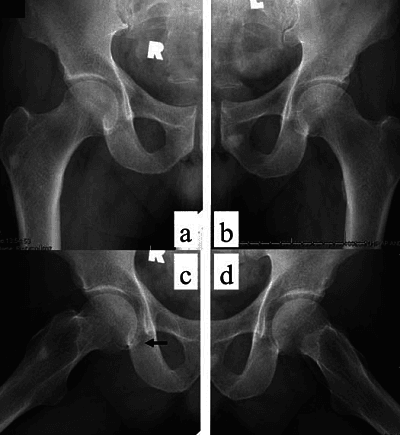 Osteoarthritis of the hip starts with deterioration of internal rotation [10,11]. The most frequent location for FAI is the anterior rim area, and the most critical motion is internal rotation of the hip at 90° flexion . Thus, the internal rotation is the important motion to detect the early stage of OA and FAI, which can be accurately demonstrated by the pendulum test. It may also be performed in patients after total hip replacement and femoral head replacement without the risk of dislocation. A limitation of this study is a small number of patients evaluated. However the pendulum test has been performed on many patients in our institution, and we have been satisfied with the ease with which it can elicit hip discomfort due to a diseased hip joint, even at a very early stage of OA. We have found that limited rotation, particularly internal rotation, of the hip joint while a patient is seated with the hip and knee flexed at 90° is extremely predictive of hip pathology. The positive pendulum test highly correlated to the hip pathology. We consider the pendulum test to be a very accurate and useful maneuver in the evaluation of hip joints, even when patients have a simultaneous pathology of the low back, hip, or knee. Yasushi Oshima, MD, and Joseph Fetto, MD, are from the Division of Adult Reconstructive Surgery, Department of Orthopaedic Surgery, at New York University Hospital for Joint Diseases, New York, New York. Oshima Y, Fetto J. Pendulum Test: A Highly Accurate and Simple Physical Examination Maneuver to Identify Hip Pathology. Reconstructive Review. 2015;5(3):45-9. doi: http://dx.doi.org/10.15438/rr.5.3.119 © 2015 JISRF. All rights reserved. All articles published are the shared property of its authors and Reconstructive Review. The Journal allows authors to share publishing rights without restrictions. Reconstructive Review follows the Creative Commons Attribution-NonCommercial-NoDerivs CC BY-NC-ND. Gray H, Articulations of the lower extremity, Gray’s Anatomy, Fifteenth edition, 1995, 240-246. Martin HD, Savage A, Braly BA, Palmer IJ, Beall DP, Kelly B. The function of the hip capsular ligaments: a quantitative report. Arthroscopy. 2008;24(2):188-195. Myers SR, Eijer H, Ganz R. Anterior femoroacetabular impingement after periacetabular osteotomy. Clin Orthop Relat Res. 1999;363:93-99. Ganz R, Parvizi J, Beck M, Leunig M, Notzli H, Siebenrock KA. Femoroacetabular impingement: a cause for osteoarthritis of the hip. Clin Orthop Relat Res. 2003;417:112–120. Theiler R, Stucki G, Schütz R, Hofer H, Seifert B, Tyndall A, Michel BA. Parametric and non-parametric measures in the assessment of knee and hip osteoarthritis: interobserver reliability and correlation with radiology. Osteoarthritis Cartilage. 1996;4(1):35-42. Cibere J, Thorne A, Bellamy N, Greidanus N, Chalmers A, Mahomed N, Shojania K, Kopec J, Esdaile JM. Reliability of the hip examination in osteoarthritis: effect of standardization. Arthritis Rheum. 2008;15;59(3):373-381. Martin RL, Sekiya JK., The interrater reliability of 4 clinical tests used to assess individuals with musculoskeletal hip pain. J Orthop Sports Phys Ther. 2008;38(2):71-77. Lee KM, Chung CY, Kwon DG, Han HS, Choi IH, Park MS. Reliability of physical examination in the measurement of hip flexion contracture and correlation with gait parameters in cerebral palsy. J Bone Joint Surg Am. 2011;19;93(2):150-158. Croft PR, Nahit ES, Macfarlane GJ, Silman AJ. Interobserver reliability in measuring flexion, internal rotation, and external rotation of the hip using a plurimeter. Ann Rheum Dis. 1996;55(5): 320–323. Holla JF, van der Leeden M, Roorda LD, Bierma-Zeinstra SM, Damen J, Dekker J, Steultjens MP. Diagnostic accuracy of range of motion measurements in early symptomatic hip and/or knee osteoarthritis. Arthritis Care Res. 2012 Jan;64(1):59-65. Ganz R, Leunig M, Leunig-Ganz K, Harris WH. The etiology of osteoarthritis of the hip: an integrated mechanical concept. Clin Orthop Relat Res. 2008;466(2):264-272.